JetBlue (JetBlue Airways Corporation) has gone straight up. Not only the plane, but also the stock. JetBlue is an American low-cost airline and the 5th largest airline in the United States. The company is headquartered in the Long Island City neighborhood of the New York City borough of Queens, with its main base at John F. Kennedy international Airport. JetBlue is founded by David Neeleman in 1999, under the name NewAir. This is not the first time I`m writing about David Neeleman. I wrote about him last year when I wrote an article about Azul Airlines, which is one of Brazil`s biggest low-cost airline companies. I also wrote about American Airlines long before the oil price started to plunge. The stock is up over 700 percent in just a few years. So is it for JetBlue. The company is a big success. They have rewarded a near sixfold increase in its share price in a few years. We have seen a broad rally for many airlines stocks. It has been a real «take off». JetBlue`s revenue passenger miles increased 13,3 percent to 3,097 last month. The carrie`s capacity was up 13,1 percent to 3,821 Billion available seat miles. Departures were 10 percent higher YoY, while the average flight length was 1,2 percent longer at 1,068 miles. Passenger revenue per available seat was only up 1 percent since last September. The stock has been falling this week and J.P Morgan has downgraded the stock from Overweight to a Neutral rating with a new price target of $27. JetBlue`s stock price is now $24 after dropping down earlier this week. It can be a bit confusing for someone because of the good news we got from JetBlue, but it is also very important to have close look at the oil price. All the airlines stocks are reacting to the oil price which has jumped recently and so will the airlines earnings and revenues. They will decline. Higher oil price are lowering the airlines stock prices. We can also see that smart money are now more cautious towards some airline stocks. Some hedge funds has sold shares in American Airline, but why are they doing that? Price earnings is only 7,58. Price earnings in JetBlue is higher, and the stocks`s P/E is 18,32. More than twice as much as American Airlines. 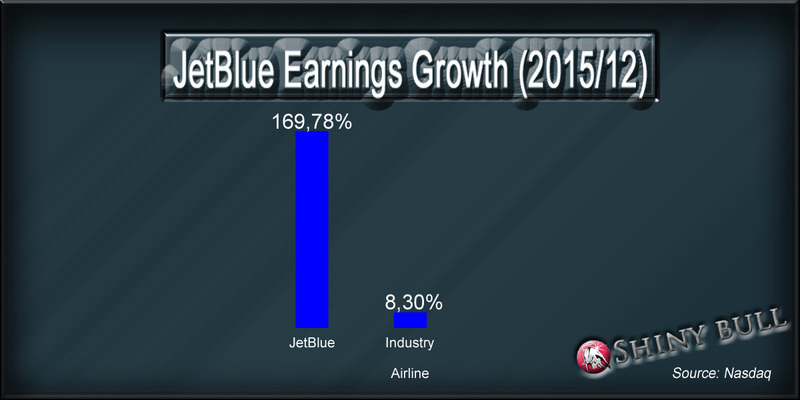 JetBlue need to do a great job to execute well in order to satisfy their growth investors. So far, it looks good. JetBlue`s shares is up over 50 percent so far this year, but have dropped over 7 percent in a few days during some volatile trading. The stock will probably consolidate for some time now. The shares have performed very well of late, so the stock is just taking a breath right now, while we at the same time are looking for the oil price. J.P Morgan lowered the airline industry`s per-seat revenue outlook for 2016 from growth of 1,3 percent to a drop of -2 percent. One insider director of JetBlue sold 14,276 shares at $25,39 per share yesterday. Total holding is 601,772 shares. Institutional investors own about 94 percent, while company management own 0,6 percent. Insider ownership last six month is down -12,27 percent, while institutional ownership is down only 0,1 percent last three-month. JetBlue are flying high in the blue sky.